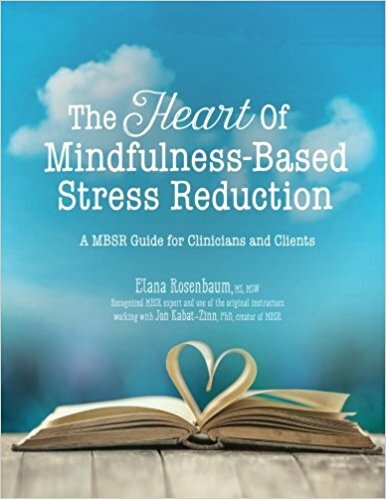 Elana's dedication to sharing mindfulness can be felt in both her books and her lectures. Maintaining a state of well-being and equanimity in the midst of serious disease is a challenge, but mindfulness can help make it possible. It is a process of bringing a fierce but loving attention to everything that arises in our mind and body. The simple techniques Elana Rosenbaum presents here are the same ones she uses with the people in her practice of mindfulness-based psychotherapy and stress reduction—and that she uses herself as a cancer survivor. These are methods that offer proof positive that it is indeed possible not only to “have a life” while you’re seriously ill, but that the life can include satisfaction, ease, and happiness. This book includes a downloadable companion 60-minute audio program. Explore Setting an Intention meditation from this book. Available at Shambhala Press and Amazon. Using powerful, yet simple, tools and strategies, The Heart of Mindfulness-Based Stress Reduction guides you to heal through awareness and reinforcing what is right rather than what is wrong. A valuable resource in any practice, this workbook is filled with evidence-based approaches for healing and improving treatment outcomes for anxiety, depression, addictions, grief, trauma and catastrophic illness. Elana embodies in herself everything she teaches others, for the most part now cancer patients. Her authority, her authenticity, and her personal commitment entrain just about everyone into the beauty already to be found in their own lives, often obscured by the shadow of their disease, and all the ghosts of fear and pain and turmoil associated with it. You have to know Elana to really appreciate her luminosity, her effervescence, and her unbridled enthusiasm for life. She radiates the determination and, strange to say, the innocence and purity of The Little Engine That Could like nobody else I have ever met. Now, in these pages, you have the priceless opportunity to get to know her and share in her remarkable energies….